This is a short addition to the my recent article on the financial crash anniversary -Lehman Bankruptcy and Engineered Financial Armageddon Real Story, which covered the reasons behind the financial crash of 2008, time line of the crash and the geopolitical implications going forward. The following video illustrates just how close the U.S. Financial System came towards total collapse. 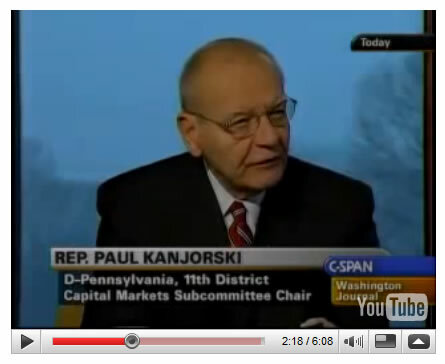 At 2 minutes, 20 seconds into this C-Span video clip, Rep. Paul Kanjorski of Pennsylvania in February 2009 explains how the Federal Reserve told Congress members about a "tremendous draw-down of money market accounts in the United States, to the tune of $550 billion dollars." According to Kanjorski, this electronic transfer occurred over the period of an hour and threatened a further $5 trillion to be drawn out triggering a total collapse of the Financial System, which prompted Hank Paulson's emergency $700 billion TARP bailout action. Could it happen again ? Protectionism is the main risk that could spark another Lehman's style event. The stocks bull market that has run to over 50% (as anticipated) is primed for a serious correction. Interest rates at zero can only go up, the money markets will move long before the central banks move base rates so watch the government bond markets to enter a prolonged bear market.